Blumat systems need low pressure, much less than comes from normal house water connections. 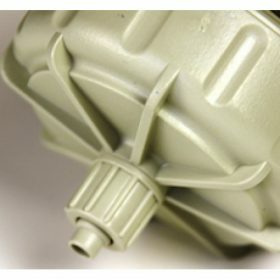 The kits include an adapter to connect to a low-pressure water tank but if your storage tank is high uphill or if you want to connect to a faucet or garden hose, you’ll need a pressure regulator. There are cheaper versions out there but this one was designed specifically for Blumat systems and adapts to the standard 8 mm tubing that Blumats use. 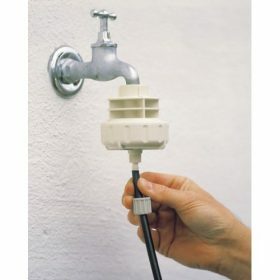 Blumat systems need low pressure, much less than comes from normal house water connections. 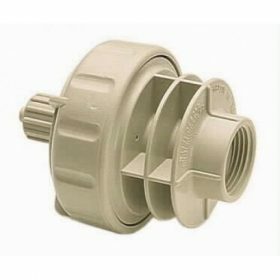 Some of our kits include one of these but if you’d like to install the other ones or the separate components to a home water system, you’ll need one of these Pressure Reducers. In gravity systems you’ll also need one if your storage tank is high uphill. 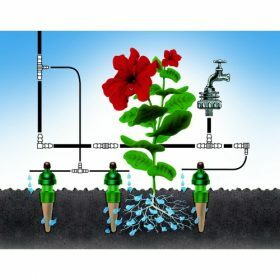 In Grow Rooms and Greenhouses with a reservoir for mixing nutrients, you can connect a small pressure pump to this and automatically feed your plants when you water. On one side it adapts to a 3/4″ male hose thread and on the other directly to the Blumat 8 mm supply tube. Maximum input pressure is 87 psi.